Chelsea is a small, charming city situated just 15 minutes west of Ann Arbor, Michigan. Officially founded in 1850 by the Congdon brothers, Chelsea boasts historic architecture both downtown and in nearby residential areas which adds to its appeal. In fact, the downtown business district was recently included on the National Register of Historic Places. The Chelsea community is close-knit, offering that small-town American feel with its beautiful Victorian neighborhoods and historical Main Street buildings. Many local artists live and work within the city which speaks volumes. And, with the city’s many options for dining, shopping, entertainment, and vibrant arts and culture, residents can always find inspiring, interesting ways to pass the time. Sounds & Sights on Thursday Nights: Chelsea also boasts a weekly music festival, Sounds & Sights on Thursday Nights, which attracts visitors from all across Michigan. Performances take place outdoors at various spots throughout downtown Chelsea, Michigan from June 8th to August 17th from 6:30 – 8:30pm. Downtown is buzzing with live music on every street corner, featuring both well-known and new musicians and entertainers. The event features blues, folk, jazz, rock, comedy, and more. It’s a fabulous event for groups of friends, couples, or even an outing with the grandkids! The fun kicks off on June 8th from 6:30 – 8:30pm, and runs every Thursday evening until August 17th. For a complete list of this year’s lineup, visit chelseafestivals.com/soundsights. Sounds & Sights Festival: This annual summer event, which began over 30 years ago, is held in historic Chelsea, Michigan and is a highlight of summer, attracting visitors from all over the state. The two day, three-night event features a live music and social tent, indie art market, kids’ entertainment and activities, a classic car show, and so much more! Visit chelseafestivals.com for more event details. Harvest Art Market: This annual fall event began in 2008, and is held in the Maples Room at Silver Maples Retirement Neighborhood. It’s the best little art market west of Ann Arbor and east of Kalamazoo! It features a fabulous “market mix” of great wares created by more than 25 wonderful artisans that are creating in so many types of media: vintage fare and folk art, glass and mosaics, watercolor, pottery, mixed media, funky and fashion jewelry, food art & edibles, fiber art, photography…and so much more! Silver Maples’ Gallery 100: The Gallery 100 at Silver Maples is a wonderful gallery for local artists to showcase their talents and works of art. Residents of Silver Maples and the surrounding community delight in seeing a diverse selection of art showcases ranging from watercolor, photography, stained glass, fiber arts and heritage quilts, to mixed media, unique dolls, and even vintage Hondas. It’s managed by Lois DeLeon, a resident of Silver Maples since 2007, who is using her passion for art and experience in art curating to add to the unique amenities that are available at Silver Maples Retirement Neighborhood. Showcases turnover every two (2) months which means you’ll want to visit often to check the new showcase! Kaleidoscope Concert Series: This popular concert series began in 2009 and was made possible through a 3-year grant from the Chelsea Community Foundation and the Community Foundation of Southeast Michigan which stipulated that community support would be needed for subsequent years. Thankfully many community members and businesses saw the value of the concert series and pledged support for additional years. Concerts are held in the Maples Room at Silver Maples Retirement Neighborhood and run from September through April each year. Musical performances vary from big band, folk, and swing, to light pop and jazz. While Chelsea certainly offers many opportunities to enjoy various forms of art, there are several surrounding communities who offer fabulous festivals, fairs, exhibits and musical performances. 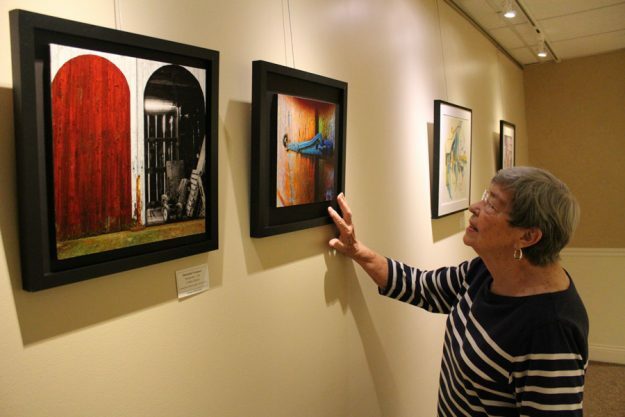 Residents enjoy a lifestyle rich in arts and culture at Silver Maples Retirement Neighborhood. Individuals enjoy strolling through our on-site Gallery 100 and attending the annual Harvest Art Market, and delight in the various musical performance that are available through our Kaleidoscope Concert Series. Cultural happenings on campus or in surrounding communities, like Ann Arbor and beyond, are a major part of our community and the lifestyle that is enjoyed. If the arts has always been a part of your life or even a new passion, you’ll want to stop by and see all that is available for you at Silver Maples. Contact us today to schedule your personal tour and explore all that our beautiful retirement neighborhood has to offer.